It is said that monks on Mount Athos in Northern Greece, started with komboloi (or worry beads), by making strands of beads made of knots tied on a string at regular intervals. These knotted prayer strings are called komboskini and they are examples of fine workmanship. Komboloi or komboskini haven been in use ever since and are very original and popular items today. Other old-time monks, made their komboloi out of handy, inexpensive materials such as wood, shells, hazelnuts and olive pits. Today there still are komboloi lovers who claim that true komboloi must only be made of organic materials like amber, coral, bone, horn, mother-of-pearl, seeds, jet (black amber) etc. The Greek word for worry beads, "komboloi", comes from the word "kombos" (knot) and the verb "leo" (to say), meaning, "in each knot, I say a prayer". They are pronounced "combo-loy". 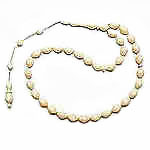 Modern Greek worry beads usually have 19-23 beads, although much larger and smaller versions exist as well, depending on the size of the beads. 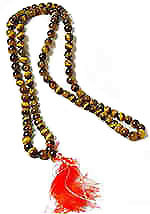 Half-worry beads (or open-style) called "begleri" (pronounced beg-le-ry), are also widespread. An exact number of beads is not needed, since they are not used to count something specific. In Greece, where modern komboloi are designed not for use in prayer but for fun and relaxation, there is an important difference in design: the cord provides enough space for the beads to move. This freedom offers pleasure through the sound the beads make, their feel and the performance of endless variations of komboloi flips and tricks. Christians, especially members of the Orthodox Church, use a 33-bead strand to recite the Jesus Prayer. There also are a number of Roman Catholic/Anglican chaplets which have 33 beads, including the Act of Spiritual Communion and the chaplet of The Little Flower. Christian "rosaries" or "strings of roses" were most likely first used in the 11-12th century during the crusades by knights who had no time to visit distant temples. These rosaries had 54 beads or half of 108 which is standard for a Buddhist malas (see below) used to track the prescribed daily recitations of the "Lord's Prayer". Muslim rosaries, called tespih, originally were made by Istanbul (Constantinople) craftsmen and sold to buyers throughout the Islamic world. They were made of gold, silver, amber, pearls,coral or other organic materials such as elephant ivory, walrus ivory, whale tooth, tortoiseshell, horn, camel bone and countless types of wood, including snake wood, ebony, blood wood, olive, rosewood, tamarind, tulip wood, satinwood, sugar maple, teak, and Burmese sandalwood. Even seeds and nuts like coconut, olive stones and date stones were used. These materials come from many parts of the world, including India, Egypt, Madagascar and South America. Tespih made of fragrant woods are kept in closed boxes to retain the fragrance. In Ottoman times rock crystal beads were preferred in summer for their coolness to the touch and for the light diffracted by the facets. This is the native Turkish terminology of prayer beads: at the top section of the beads, the long piece marking the beginning of the string is called "imame" (pronounced ee-mameh), the remaining group including the tassel is called "tepelik". Notice two different shaped beads put at each 1/3 of the chain, marking each 33 beads. These are called "durak" (stoppers) and they are not counted in the number of beads. Imame, tepelik and duraks are three main characteristics of Turkish prayer beads. Prayer beads are used to practice the zikr, a form of Muslim meditation. During the zikr, 99 sacred names of Allah, some "ayet's" or some surahs of the Koran are repeated. The beads then serve to count the number of repetitions the prayer has done. Since the allowed sacred names of Allah are limited to 99, Muslim prayer beads usually are not longer than 99 units, although mystic sects sometimes used 500 or 1000 bead tespih with very large beads. The purpose of a mala is to recite a mantra or prayer. Mala beads are similar to a rosary or "worry beads" and can be carried in the pocket or worn on the body to be used whenever you need to center yourself and focus on spirituality. They also serve as a portable "sacred space". After several months of use, you begin to relax as soon as you pick them up. This is especially helpful in stressful careers and personal life. Most malas contain 108 beads and a bigger bead at the top, called the guru bead. The sacred number 108 represents the number of names or aspects attributed to Hindu deities or gods from which Buddhism evolved. In ancient India, around 500 BC, a devoted student had to say the Mantram (prayer) 108 times. However, he didn't know how to count. The solution to this problem came by connecting 108 pierced cores with a cord and tying up the two ends. This is how the first worry bead is said to have been born.